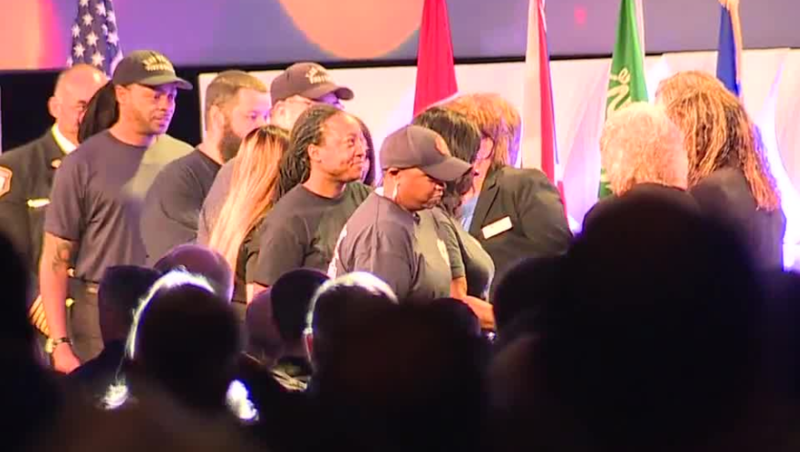 The 911 dispatchers who worked during 1 October got a standing ovation Monday as they got a big award in front of hundreds of their peers. Officially, the Combined Communications Center of Las Vegas was named the 2018 Communications Team of the Year by the Association of Public-Safety Communications Officials at the group's annual expo. These are the men and women who fielded hundreds of calls for help seconds after the mass shooting. After that day they say they are forever changed. "The group that worked that night like we have a different bond. I feel like we all know each other better. We all became very close that night," said Jordan Fox, a communications specialist. The Association of Public-Safety Communications Officials-International conference ends Aug. 8.